As a non-surgical treatment, cosmetic injectables have an impression of being a “safer” way to reduce the appearance of common signs of aging. In many ways this is true; however, there’s a big difference between safer and safe. In the wrong hands, even minimally invasive injectables can have serious risks. Dr. Eugenie Brunner, our double board certified facial plastic surgeon, is extensively trained in injection techniques and is knowledgeable about the soft tissues of the face. 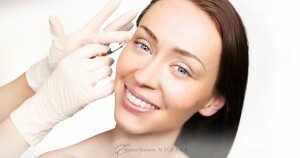 In New Jersey, only a physician should administer BOTOX® Cosmetic. While a qualified nurse may provide filler injections (which includes JUVÉDERM® and Restylane®), we recommend that only a highly trained physician like Dr. Brunner perform any injectable treatment. In addition to safety, your results will depend on the skill of the injector. With her understanding of facial skin, muscle, and other tissues, Dr. Brunner can place the injectable formula where it will be most effective. She is also familiar with how deep or shallow each injection should be, and she will customize the treatment to suit the unique needs and goals of each individual.